Raising Kids Who Turn Out RightEvery parent hopes their kids will turn out right. They pray that when their children leave the nest, they will be ready to face the world. And they hope that their kids will be equipped to stand strong in life's battles. There are no shortcuts to successful parenting . . . no secret formulas to raising kids of strength and character. However, there are steps you can take to prepare your children for the challenges ahead. But you'll need an effective game plan. With warmth and conviction, Tim Kimmel outlines a strategy for positive parenting--a plan that gives you reachable goals, while allowing for your personal parenting style. You have only a few short years with your child...make the most of the time you have. 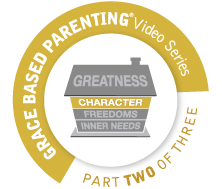 This second part of the Grace Based Parenting small group video study will give parents the confidence and skills to raise kids who flourish in their culture by building character for life. 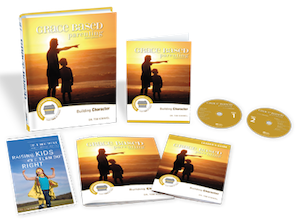 Like a blueprint serves the builder of a beautiful home, this study will give you practical ways to use character to build happy, confident children who can stand strong and reach their true potential in the future. There are steps you can take to prepare your children for the challenges ahead. If you want to raise a kid who can stand strong in a hostile world, you have to build character in his/her heart.